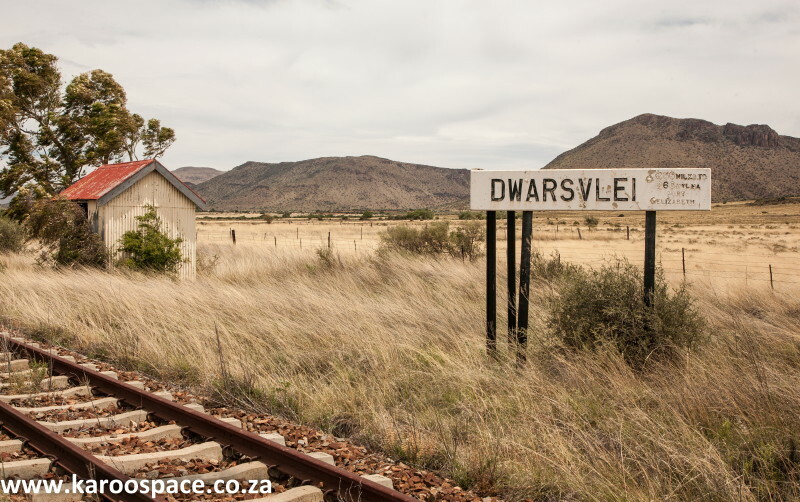 One of the most photogenic abandoned railway sidings in the Karoo: Dwarsvlei. Mid-morning on Day Three of our Karoo Heartland road trip finds us in Middelburg at the local museum. I love this place, because the displays tell strange and wonderful stories from the region – and not in a po-faced manner. Here, in the corridor, is the clock-face of the old Mother Church that lost its entire steeple back in 1967. 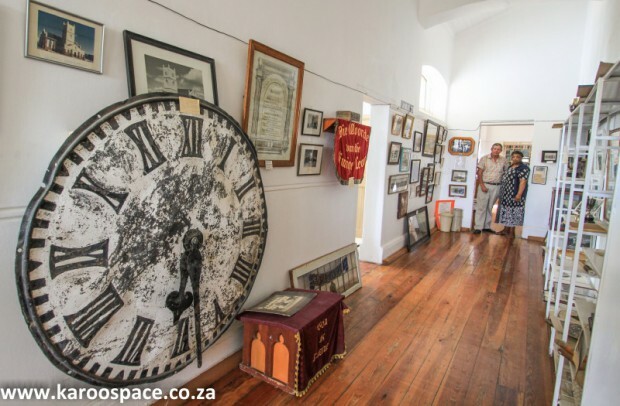 Here’s a replica of a classroom of the old Poor School of Middelburg and on a large wall display you’ll see how the Anglo-Boer War went down locally. And should you meet Hennie Coetzee, the town historian and author of the very popular Middelburg: Hede en Verlede, ask him about the following legend. Back in 1982 the old Poor School was being converted into its new identity as town museum. It was the job of Mr PF Aucamp to visit the local businesses and ask for shelving and shop mannequins for display purposes. Mr Aucamp’s wife worked at the town library. He drove up in his car, with a female mannequin in the seat next to him. In full view of everyone, he began kissing the mannequin rather passionately. Mrs Aucamp was called out to witness this act of ‘infidelity’ and was, according to reports, mightily displeased until she realised she’d been ‘had’ by her husband. The famous church clock face at the Middelburg Museum. After lunch at Picadilly’s in Middelburg we drive out to Hillston Farm to meet the Southey family. They’ve put us up in a stone cottage near the main farm house and look, right next to an Anglo-Boer War blockhouse – complete with bullet holes through the corrugated iron walls. Riana Southey and her chef-daughter Adrienne take us on a long farm walk within sight of the iconic Teebus and Koffiebus hills in the distance. Legs well stretched, drink in hand, we wander through to supper and Adrienne has done us proud. Thank goodness for the afternoon exercise. Today we have a delicious drive over the majestic Lootsberg Pass, stopping off at the Jagtpoort padstal for some droewors and bottled pineapple chili jam. Down in the valley we turn right at the sign of the owl and head into the Sneeuberg Mountains, with the ever-rising Compassberg before us. One of the self-cater cottages at Hillston Farm outside Middelburg. We’re in the village of Nieu-Bethesda and it’s time to haul out the cameras and short lenses again, for a two-hour wander through the Owl House and Camel Yard. I’m going to leave you to explore this incredible place, because I’ve spent lots of time here before. 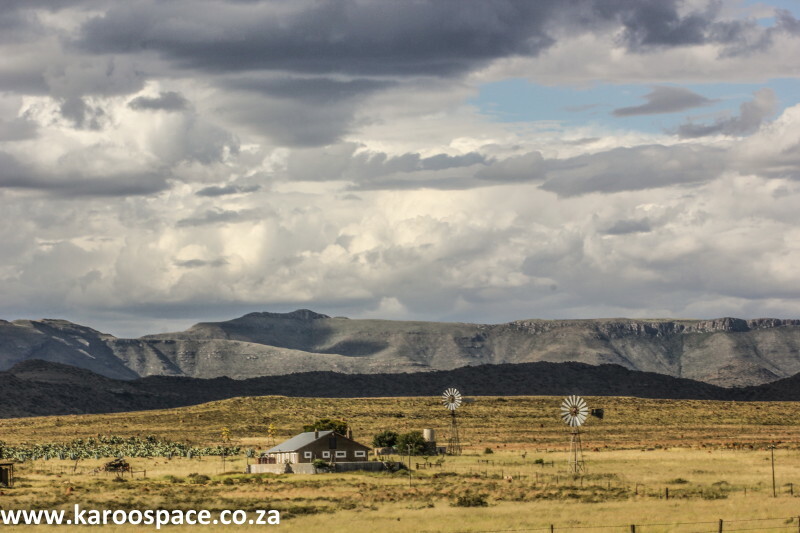 You’ll find me over the road at The Karoo Lamb, chatting to owners Ian and Katrin Allemann. Some folk don’t get the Owl House. Others think it’s a marvel of outsider art. The jury is out. 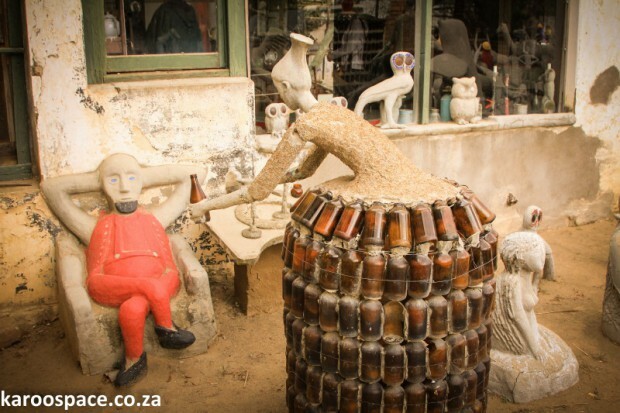 The fact is, the late Helen Martin left something behind that turned her little mountain village into a major Karoo destination. Me, I just love the vibe of being in Nieu-Bethesda. So when you’re done, we’ll cross the Gats River and have a little feast with Andre Cilliers over at The Brewery & Two Goats deli. You’re buying the first round? Champion stuff. I’ll have a Karoo Ale, please. JP Steynberg takes you on a fossil walk at Ganora Guest Farm. 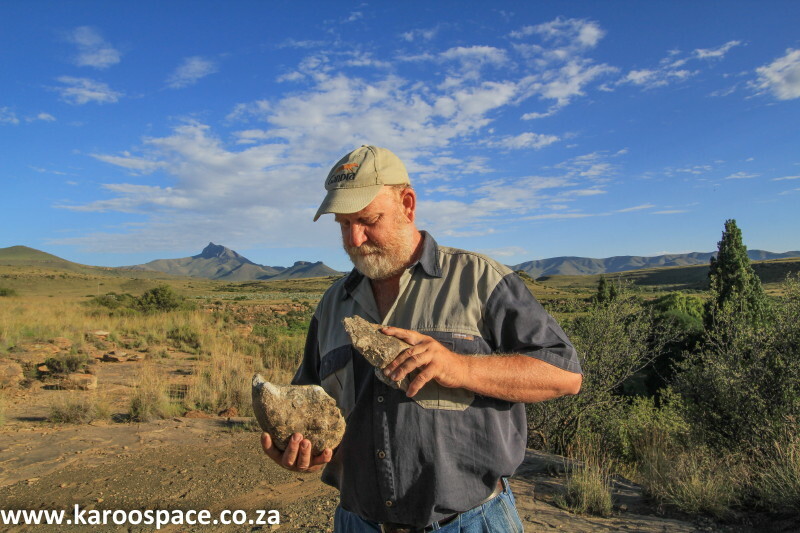 After lunch, we’ll roll on out of town to Ganora Guest Farm and those of us who don’t want to nap can go in search of owner JP Steynberg and ask him to take us on a fossil tour of his place. I wouldn’t miss it. Travellers go hundreds of kilometres out of their way to walk with JP, who knows his stuff. 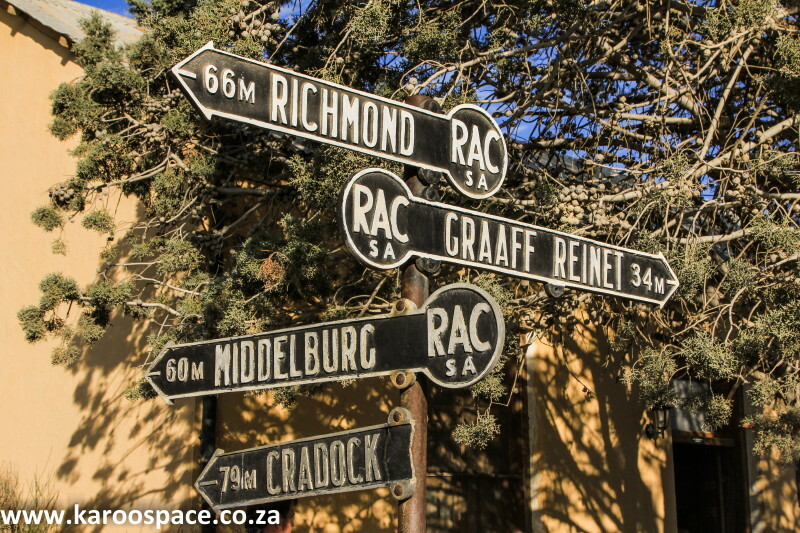 The late afternoon is spent soaking up the atmosphere (and some red wine) on this classic Karoo farm, with its own intriguing museum. Hester Steynberg will introduce you to Helen the Cape Eagle Owl. The slow-blinking, thoughtful-looking Helen was brought to Ganora with a broken wing. She lives in a roomy cage with large pumpkin leaves for shelter and fulfils her role as resident owl ambassador. Aside: If you have the stomach to pick up roadkill en route to Ganora and bag it, Helen the owl will be most grateful. All roads lead to Nieu-Bethesda, magical village in the Sneeuberge. And because we like Nieu-Bethesda so much, the next morning is reserved for the village once more. 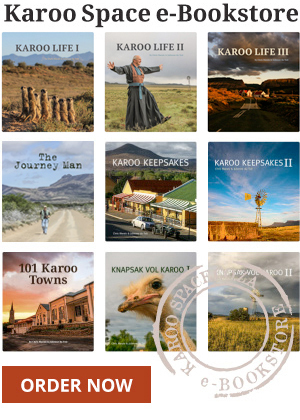 We visit Nico Zaverdinos and Victoria Nance at a buzzy little bookshop called Dustcovers, where I’ll probably do a whole marketing spiel about our Karoo Keepsakes series of traveller’s companions – which they stock. I’ll take you off to meet a couple of the local folks, like Terry Winship of the Ibis Lounge (great coffee and free wi-fi for you connectivos) and local dominee Charl du Toit, who sells dinkum stone-ground wheat produced from the antique village mill which he helped to restore. After lunch at The Karoo Lamb, we’re off to Wellwood Farm, owned by the legendary Rubidge family. Before we get fully ensconced in Trymore Cottage, I want to show you the fossil museum. Better still, let’s ask Marion Rubidge to take us on a tour.